Both inhalation and exhalation depend on pressure gradients between the lungs and atmosphere, as well as the muscles in the thoracic cavity. The mechanics of breathing follow Boyle’s Law which states that pressure and volume have an inverse relationship. The process of inhalation occurs due to an increase in the lung volume (diaphragm contraction and chest wall expansion) which results in a decrease in lung pressure in comparison to the atmosphere; thus, air rushes in the airway. The process of exhalation occurs due to an elastic recoil of the lung tissue which causes a decrease in volume, resulting in increased pressure in comparison to the atmosphere; thus, air rushes out of the airway. There is no contraction of muscles during exhalation; it is considered a passive process. The lung is protected by layers of tissue referred to as the visceral pleura and parietal pleura; the intrapleural space contains a small amount of fluid that protects the tissue by reducing friction. The relationship between gas pressure and volume helps to explain the mechanics of breathing. Boyle’s Law is the gas law which states that in a closed space, pressure and volume are inversely related. As volume decreases, pressure increases and vice versa. When discussing the detailed mechanics of breathing, it is important to keep this inverse relationship in mind. Boyles law: This graph of data from Boyle’s original 1662 experiment shows that pressure and volume are inversely related. No units are given as Boyle used arbitrary units in his experiments. The thoracic cavity, or chest cavity, always has a slight, negative pressure which aids in keeping the airways of the lungs open. During the process of inhalation, the lung volume expands as a result of the contraction of the diaphragm and intercostal muscles (the muscles that are connected to the rib cage), thus expanding the thoracic cavity. 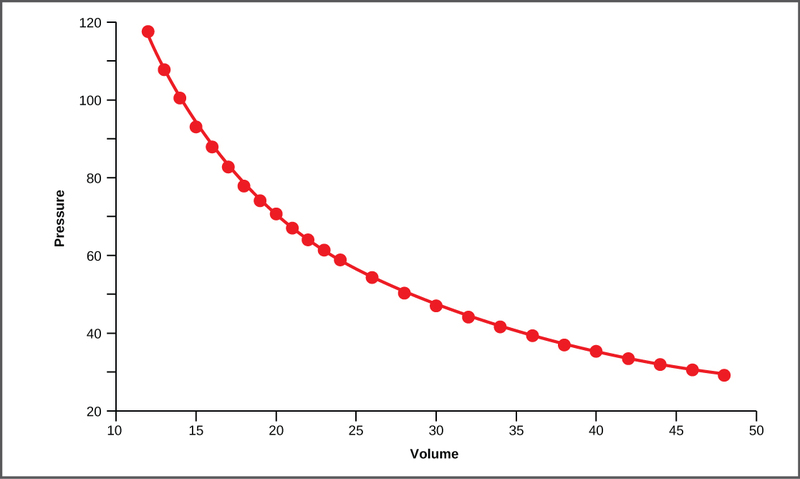 Due to this increase in volume, the pressure is decreased, based on the principles of Boyle’s Law. This decrease of pressure in the thoracic cavity relative to the environment makes the cavity pressure less than the atmospheric pressure. This pressure gradient between the atmosphere and the thoracic cavity allows air to rush into the lungs; inhalation occurs. The resulting increase in volume is largely attributed to an increase in alveolar space because the bronchioles and bronchi are stiff structures that do not change in size. Inhalation and exhalation: The lungs, chest wall, and diaphragm are all involved in respiration, both (a) inhalation and (b) expiration. During this process, the chest wall expands out and away from the lungs. The lungs are elastic; therefore, when air fills the lungs, the elastic recoil within the tissues of the lung exerts pressure back toward the interior of the lungs. These outward and inward forces compete to inflate and deflate the lung with every breath. Upon exhalation, the lungs recoil to force the air out of the lungs. The intercostal muscles relax, returning the chest wall to its original position. During exhalation, the diaphragm also relaxes, moving higher into the thoracic cavity. This increases the pressure within the thoracic cavity relative to the environment. Air rushes out of the lungs due to the pressure gradient between the thoracic cavity and the atmosphere. This movement of air out of the lungs is classified as a passive event since there are no muscles contracting to expel the air. Each lung is surrounded by an invaginated sac. 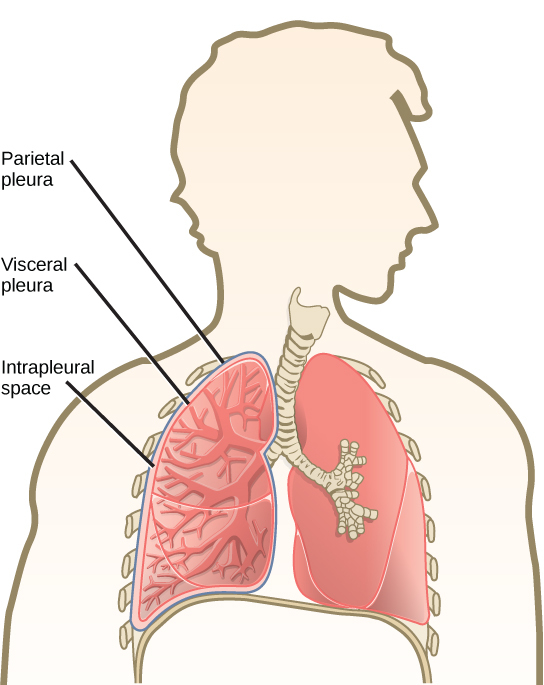 The layer of tissue that covers the lung and dips into spaces is called the visceral pleura. A second layer of parietal pleura lines the interior of the thorax. The space between these layers, the intrapleural space, contains a small amount of fluid that protects the tissue by reducing the friction generated from rubbing the tissue layers together as the lungs contract and relax. If these layers of tissues become inflamed, this is categorized as pleurisy: a painful inflammation that increases the pressure within the thoracic cavity, reducing the volume of the lung. Visceral pleura: A tissue layer called pleura surrounds the lung and interior of the thoracic cavity. Types of breathing in humans include eupnea, hyperpnea, diaphragmatic, and costal breathing; each requires slightly different processes. Eupnea is normal quiet breathing that requires contraction of the diaphragm and external intercostal muscles. Diaphragmatic breathing requires contraction of the diaphragm and is also called deep breathing. Costal breathing requires contraction of the intercostal muscles and is also called shallow breathing. Hyperpnea is forced breathing and requires muscle contractions during both inspiration and expiration such as contraction of the diaphragm, intercostal muscles, and accessory muscles. Amphibians utilize gills for breathing early in life and later develop primitive lungs in their adult life; additionally, they are able to breathe through their skin. Birds have evolved a directional respiratory system that allows them to obtain oxygen at high altitudes: air flows in one direction while blood flows in another, allowing efficient gas exchange. 1) Eupnea: a mode of breathing that occurs at rest and does not require the cognitive thought of the individual. During eupnea, also referred to as quiet breathing, the diaphragm and external intercostals must contract. 2) Diaphragmatic breathing: a mode of breathing that requires the diaphragm to contract. As the diaphragm relaxes, air passively leaves the lungs. This type of breathing is also known as deep breathing. Diaphragmatic breathing: Animation of a diaphragm exhaling and inhaling, demonstrating diaphragmatic breathing. During inhalation, the diaphragm is contracted which increases the volume of the lung cavity. During exhalation, the diaphragm is relaxed which decreases the volume of the lung cavity. 3) Costal breathing: a mode of breathing that requires contraction of the intercostal muscles. As the intercostal muscles relax, air passively leaves the lungs. This type of breathing is also known as shallow breathing. 4) Hyperpnea: a mode of breathing that can occur during exercise or actions that require the active manipulation of breathing, such as singing. During hyperpnea, also known as forced breathing, inspiration and expiration both occur due to muscle contractions. In addition to the contraction of the diaphragm and intercostal muscles, other accessory muscles must also contract. During forced inspiration, muscles of the neck, including the scalenes, contract and lift the thoracic wall, increasing lung volume. During forced expiration, accessory muscles of the abdomen, including the obliques, contract, forcing abdominal organs upward against the diaphragm. This helps to push the diaphragm further into the thorax, pushing more air out. In addition, accessory muscles (primarily the internal intercostals) help to compress the rib cage, which also reduces the volume of the thoracic cavity. In animals such as amphibians, there have been multiple ways of breathing that have evolved. In young amphibians, such as tadpoles that do not leave the water, gills are used to breathe. There are some amphibians that retain gills for life. As the tadpole grows, the gills disappear and lungs grow. These lungs are primitive and not as evolved as mammalian lungs. Adult amphibians are lacking or have a reduced diaphragm, so breathing via lungs is forced. The other means of breathing for amphibians is diffusion across the skin. To aid this diffusion, amphibian skin must remain moist. Other animals, such as birds, must face a unique challenge with respect to breathing, which is that they fly. Flying consumes a large amount of energy; therefore, birds require a lot of oxygen to aid their metabolic processes. They have evolved a respiratory system that supplies them with the oxygen needed to enable flying. Similar to mammals, birds have lungs, which are organs specialized for gas exchange. Oxygenated air, taken in during inhalation, diffuses across the surface of the lungs into the bloodstream, while carbon dioxide diffuses from the blood into the lungs and is expelled during exhalation. 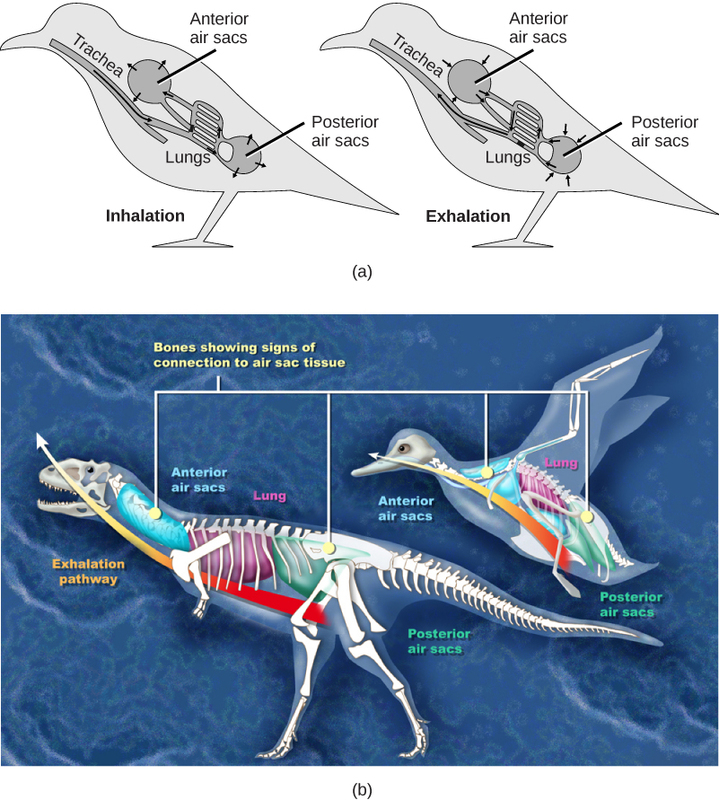 However, the details of breathing between birds and mammals differ substantially. In addition to lungs, birds have air sacs inside their body that are attached to the lungs. Air flows in one direction from the posterior air sacs to the lungs and out of the anterior air sacs. The flow of air is in the opposite direction from blood flow, which allows efficient gas exchange. This type of breathing enables birds to obtain the requisite oxygen, even at higher altitudes where the oxygen concentration is low. This directionality of airflow requires two cycles of air intake and exhalation to completely remove the air from the lungs. Avian respiratory system: (a) Birds have a flow-through respiratory system in which air flows unidirectionally from the posterior sacs into the lungs, then into the anterior air sacs. The air sacs connect to openings in hollow bones. (b) Dinosaurs, from which birds descended, have similar hollow bones and are believed to have had a similar respiratory system. Breathing includes several components, including flow-resistive and elastic work; surfactant production; and lung resistance and compliance. Both flow-resistive and elastic work are conducted during the act of respiration; flow-resistive work involves the alveoli and tissues, while elastic work involves the intercostal muscles, chest wall, and diaphragm. These types of work function in an inverse relationship; for example, increasing the rate of respiration results in an increase in the flow-resistive work and a decrease in the elastic work. Surfactant is a phospholipid and lipoprotein substance produced in the lungs that functions similarly to a detergent: it reduces the surface tension between alveoli tissue and air within the alveoli, thereby reducing the work needed for airway inflation. Lung resistance plays a key role in the ability to efficiently exchange gases; if there is obstruction (resistance) within the airways, the result will be decreased gas exchange. Lung compliance plays a key role in the ability to efficiently exchange gases; if there is too much of an increase or decrease in elasticity of the lung, the result will be disruption of gas exchange, which will cause obstructive or restrictive diseases. The number of breaths per minute is the respiratory rate; under non-exertion conditions, the human respiratory rate averages around 12–15 breaths/minute. The respiratory rate contributes to the alveolar ventilation, or how much air moves into and out of the alveoli, which prevents carbon dioxide buildup in the alveoli. There are two ways to keep the alveolar ventilation constant: increase the respiratory rate while decreasing the tidal volume of air per breath (shallow breathing), or decrease the respiratory rate while increasing the tidal volume per breath. In either case, the ventilation remains the same, but the work done and type of work needed are quite different. Both tidal volume and respiratory rate are closely regulated when oxygen demand increases. There are two types of work conducted during respiration: flow-resistive and elastic work. Flow-resistive work refers to the work of the alveoli and tissues in the lung, whereas elastic work refers to the work of the intercostal muscles, chest wall, and diaphragm. When the respiratory rate is increased, the flow-resistive work of the airways is increased and the elastic work of the muscles is decreased. When the respiratory rate is decreased, the flow-resistive work is decreased and the elastic work is increased. The air-tissue/water interface of the alveoli has a high surface tension, which is similar to the surface tension of water at the liquid-air interface of a water droplet that results in the bonding of the water molecules together. Surfactant is a complex mixture of phospholipids and lipoproteins that works to reduce the surface tension that exists between the alveoli tissue and the air found within the alveoli. By lowering the surface tension of the alveolar fluid, it reduces the tendency of alveoli to collapse. Surfactant works like a detergent to reduce the surface tension, allowing for easier inflation of the airways. When a balloon is first inflated, it takes a large amount of effort to stretch the plastic and start to inflate the balloon. If a little bit of detergent were applied to the interior of the balloon, then the amount of effort or work needed to begin to inflate the balloon would decrease; it would become much easier. This same principle applies to the airways. A small amount of surfactant on the airway tissues reduces the effort or work needed to inflate those airways and is also important for preventing collapse of small alveoli relative to large alveoli. Sometimes, in babies that are born prematurely, there is lack of surfactant production; as a result, they suffer from respiratory distress syndrome and require more effort to inflate the lungs. In pulmonary diseases, the rate of gas exchange into and out of the lungs is reduced. Two main causes of decreased gas exchange are compliance (how elastic the lung is) and resistance (how much obstruction exists in the airways). A change in either can dramatically alter breathing and the ability to take in oxygen and release carbon dioxide. Examples of restrictive diseases are respiratory distress syndrome and pulmonary fibrosis. In both diseases, the airways are less compliant and stiff or fibrotic, resulting in a decrease in compliance because the lung tissue cannot bend and move. In these types of restrictive diseases, the intrapleural pressure is more positive and the airways collapse upon exhalation, which traps air in the lungs. Forced or functional vital capacity (FVC), which is the amount of air that can be forcibly exhaled after taking the deepest breath possible, is much lower than in normal patients; the time it takes to exhale most of the air is greatly prolonged. A patient suffering from these diseases cannot exhale the normal amount of air. 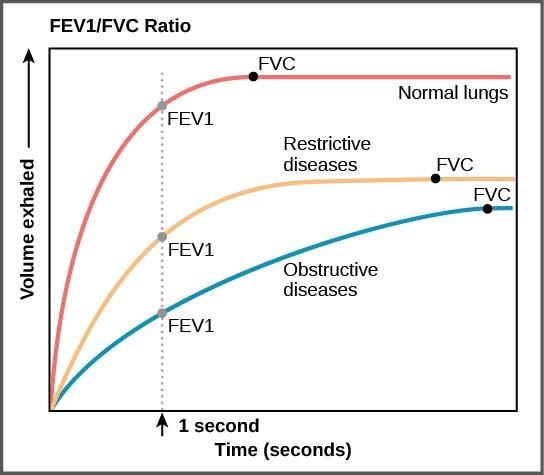 FEV1/FVC ratio: The ratio of FEV1 (the amount of air that can be forcibly exhaled in one second after taking a deep breath) to FVC (the total amount of air that can be forcibly exhaled) can be used to diagnose whether a person has restrictive or obstructive lung disease. Obstructive diseases and conditions include emphysema, asthma, and pulmonary edema. In emphysema, which mostly arises from smoking tobacco, the walls of the alveoli are destroyed, decreasing the surface area for gas exchange. The overall compliance of the lungs is increased, because as the alveolar walls are damaged, lung elastic recoil decreases due to a loss of elastic fibers; more air is trapped in the lungs at the end of exhalation. Asthma is a disease in which inflammation is triggered by environmental factors, obstructing the airways. The obstruction may be due to edema, smooth muscle spasms in the walls of the bronchioles, increased mucus secretion, damage to the epithelia of the airways, or a combination of these events. Those with asthma or edema experience increased occlusion from increased inflammation of the airways. This tends to block the airways, preventing the proper movement of gases. Those with obstructive diseases have large volumes of air trapped after exhalation. They breathe at a very high lung volume to compensate for the lack of airway recruitment. Dead space is a broken down or blocked region of the lung that produces a mismatch of air and blood in the lungs (V/Q mismatch). At times, there is a mismatch between the amount of air (ventilation, V) and the amount of blood (perfusion, Q) in the lungs, referred to as ventilation/perfusion (V/Q) mismatch. The two major types of V/Q mismatch that result in dead space include: anatomical dead space (caused by an anatomical issue) and physiological dead space (caused by a functional issue with the lung or arteries ). Anatomical dead space can occur due to changes in gravity (i.e. posture positions: sitting, standing, lying); it will affect both ventilation (V) and perfusion (Q). Physiological dead space can occur due to changes in function, such as in cases of infection of the lung; it will typically affect ventilation if the infection is in the lung and will affect perfusion if the functional impairment is in the arteries. In a normal, healthy individual, changes in either ventilation or perfusion will result in correction of the other factor to ensure an appropriate V/Q ratio. The pulmonary circulation pressure is very low compared to that of the systemic circulation; it is also independent of cardiac output. Recruitment is the process of opening airways that normally remain closed when cardiac output increases. As cardiac output increases, the number of capillaries and arteries that are perfused (filled with blood) increases. These capillaries and arteries are not always in use, but are ready if needed. However, at times, there is a mismatch between the amount of air (ventilation, V) and the amount of blood (perfusion, Q) in the lungs. This is referred to as ventilation/perfusion (V/Q) mismatch. There are two types of V/Q mismatch that produce dead space. Dead space is characterized by regions of broken down or blocked lung tissue. Dead spaces can severely impact breathing due to the reduction in surface area available for gas diffusion. As a result, the amount of oxygen in the blood decreases, whereas the carbon dioxide level increases. Dead space is created when no ventilation and/or perfusion takes place. Anatomical dead space, or anatomical shunt, arises from an anatomical failure, while physiological dead space, or physiological shunt, arises from a functional impairment of the lung or arteries. An example of an anatomical shunt is the effect of gravity on the lungs. The lung is particularly susceptible to changes in the magnitude and direction of gravitational forces. When someone is standing or sitting upright, the pleural pressure gradient leads to increased ventilation further down in the lung. As a result, the intrapleural pressure is more negative at the base of the lung than at the top; more air fills the bottom of the lung than the top. Likewise, it takes less energy to pump blood to the bottom of the lung than to the top when in a prone position (lying down). Perfusion of the lung is not uniform while standing or sitting. This is a result of hydrostatic forces combined with the effect of airway pressure. An anatomical shunt develops because the ventilation of the airways does not match the perfusion of the arteries surrounding those airways. As a result, the rate of gas exchange is reduced. Note that this does not occur when lying down because in this position, gravity does not preferentially pull the bottom of the lung down. When a healthy individual stands up quickly after lying down for a while, both ventilation and perfusion increase. Pulmonary edema: A physiological shunt can develop if there is infection or edema in the lung which decreases ventilation, but does not affect perfusion; thus, the ventilation/perfusion ratio is affected. 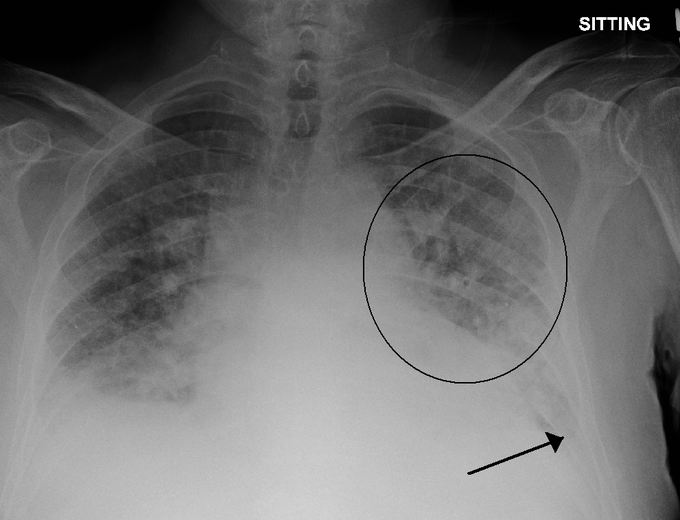 Pulmonary edema with small pleural effusions on both sides (as shown) can cause changes in the V/Q ratio. The lung has the capability to compensate for mismatches in ventilation and perfusion. If ventilation is greater than perfusion, the arterioles dilate and the bronchioles constrict, increasing perfusion while reducing ventilation. Likewise, if ventilation is less than perfusion, the arterioles constrict while the bronchioles dilate to correct the imbalance.